The Granary01263 715779work01603 870304fax Self-cateringSet in beautiful countryside on the owners working farm, The Granary is full of character with exposed beams and brockwork. There are footpaths and quiet lanes from the door ideal for walking or cycling, Blicking Hall, a national Trust proerty is close by, and the attractive market town of Aylsham has a great selection of small shops and places to eat. • General: Night storage heaters, electric heaters and gas living flame fire. • Other: Towels, Travel cot, Highchair, Books and games provided. Tumble dryer available in outside storage. The Granary offers weekly bookings starting on Friday. 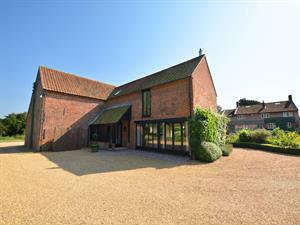 Set in beautiful countryside on the owners working farm, The Granary is full of character with exposed beams and brockwork. There are footpaths and quiet lanes from the door ideal for walking or cycling, Blicking Hall, a national Trust proerty is close by, and the attractive market town of Aylsham has a great selection of small shops and places to eat.